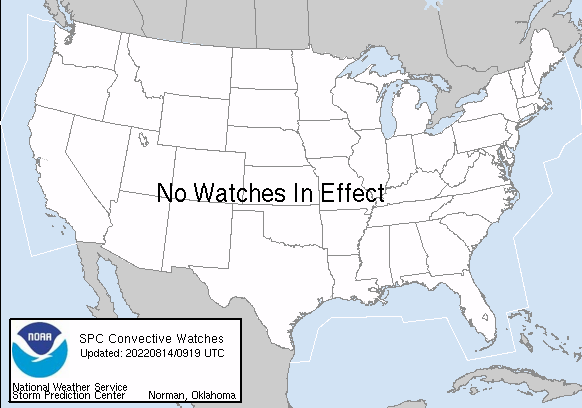 First Significant Winter Storm The End Of The Week? 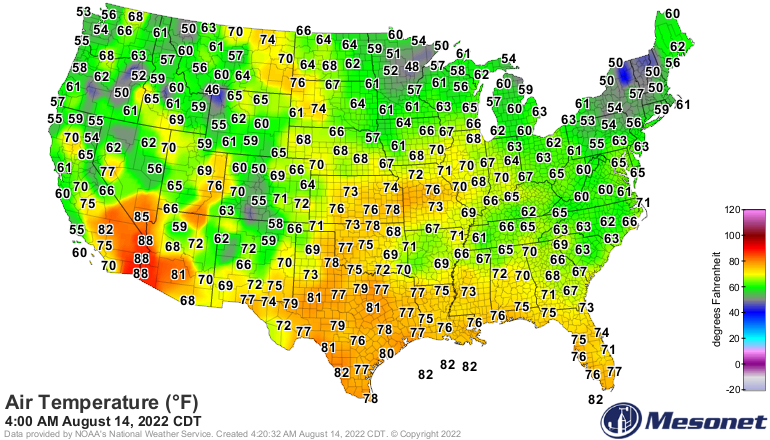 Preliminary Low Temps This AM. 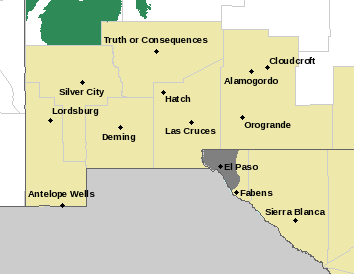 Maps Are Courtesy Of NM MesoWest Weather. Brrrrrr. Its a tad chilly out there this Sunday morning. My low temp here at my home in Carlsbad has been 21. 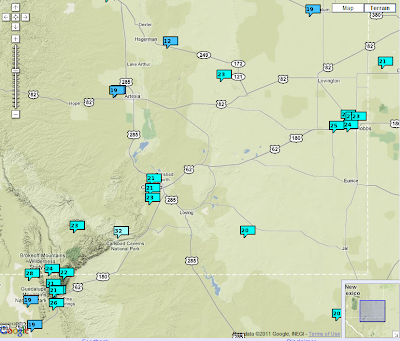 The coldest reading that I can find has been the 8 at the Fort Stanton Raws. 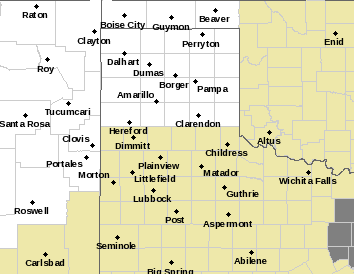 Close behind is the 12 recorded at the automated station located 10 miles ESE of Hagerman. The Mayhill Raws isn't far behind with a low of 14. Today will be a little warmer than yesterday with our afternoon high temps rising up into the upper 50's. 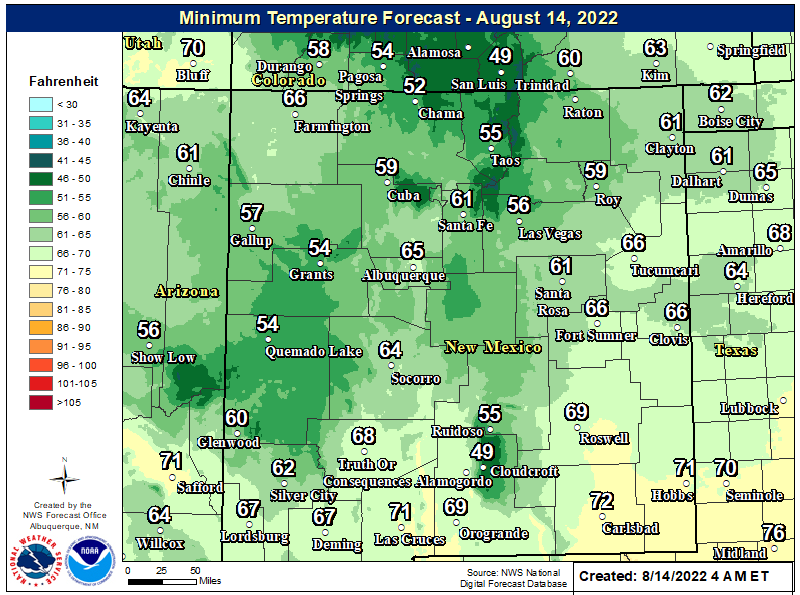 Highs on Monday will be even warmer with readings near 70. Another dry cold front will enter the area Monday night and this will knock our highs back down into the 50's on Tuesday. Wednesday will be warmer with highs in the mid 60's. 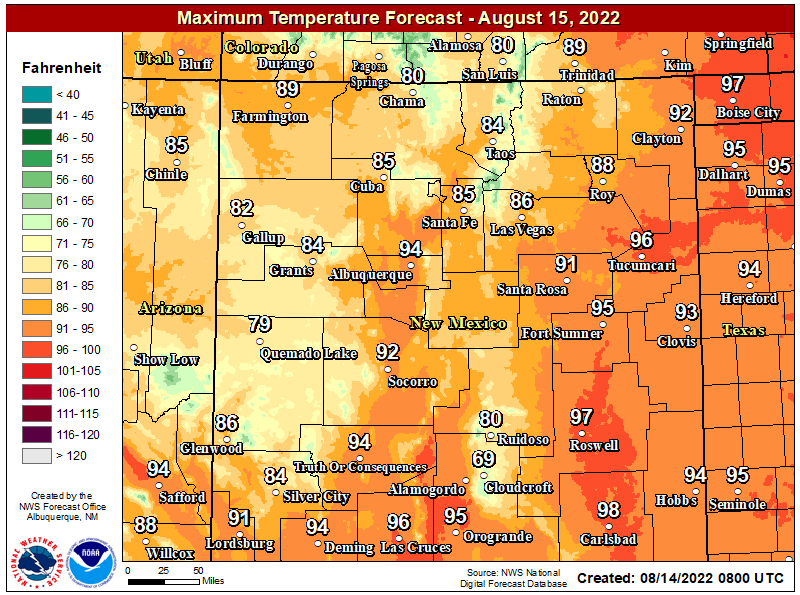 New Mexico Outlook End Of This Week. 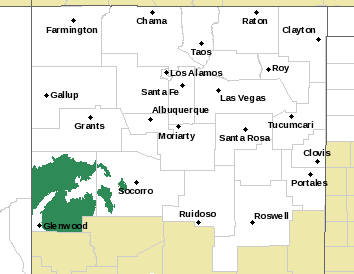 Map Is Courtesy Of The Albuquerque NWS Office. 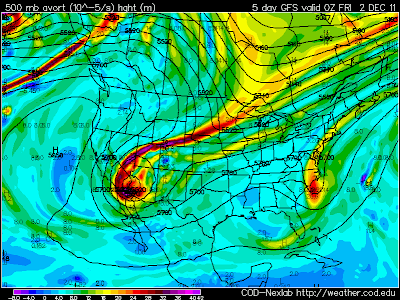 GFS 500 MB Heights/Vorticity Forecast. 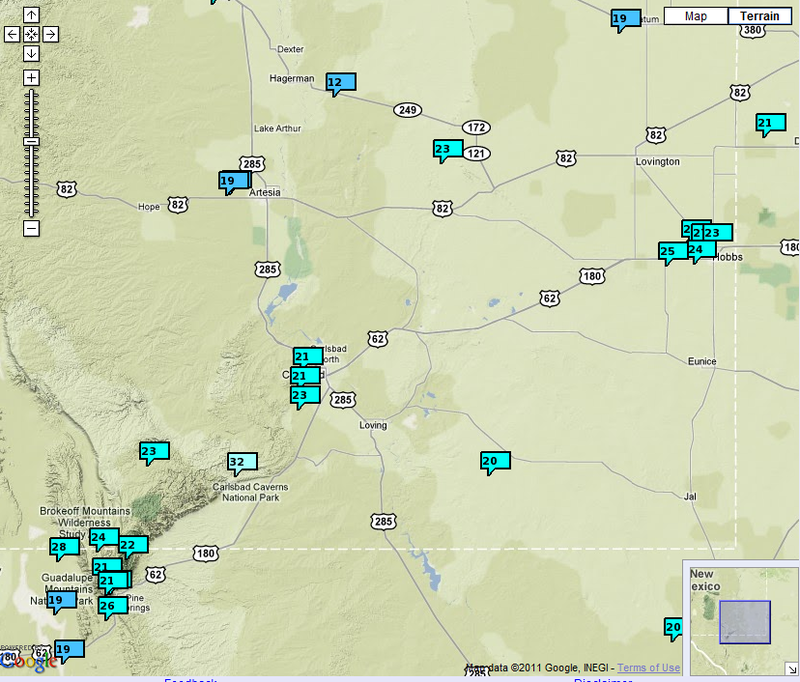 Valid At 5 PM MST Thu Dec 1, 2011. 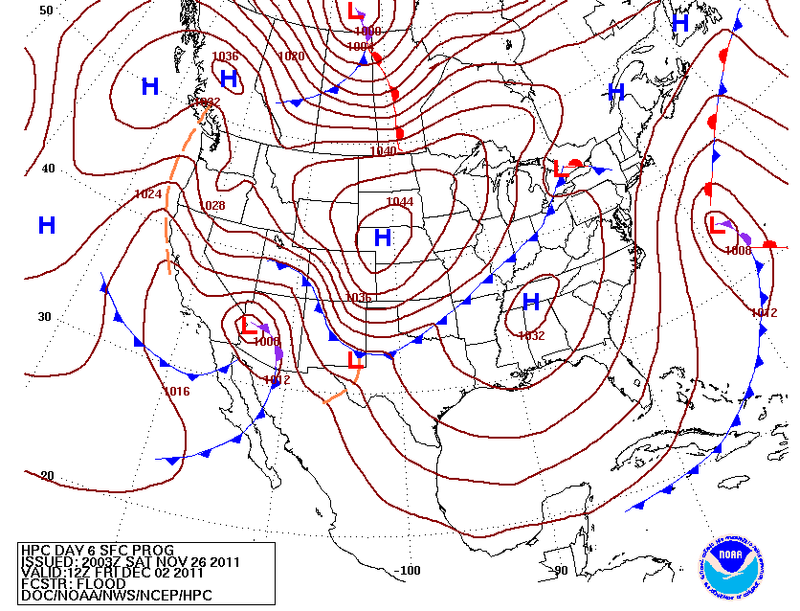 Surface Map Forecast Valid At 12Z/5 AM MST Fri Dec 2, 2011. 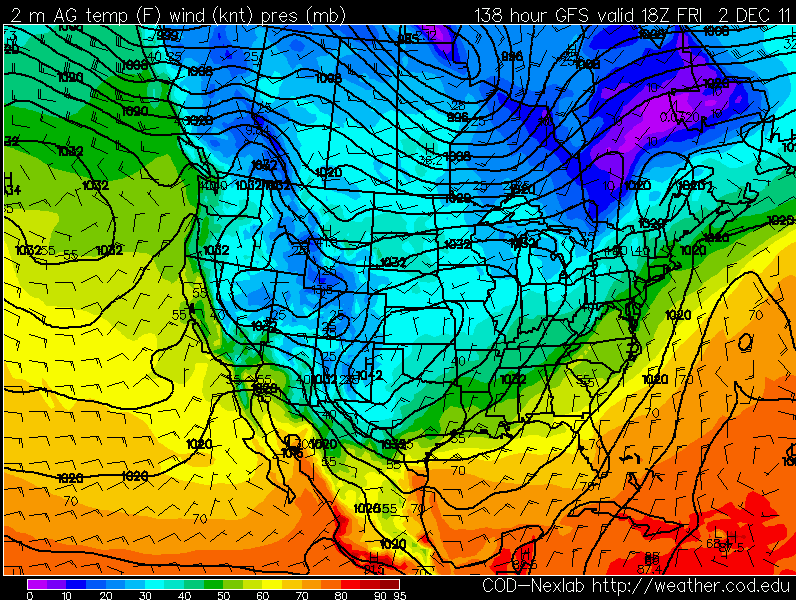 GFS Sfc Temp Forecast Valid At 11 AM Fri Dec 2, 2011. There has been little run to run consistency with the models concerning the seasons first potentially significant winter storm for the state. 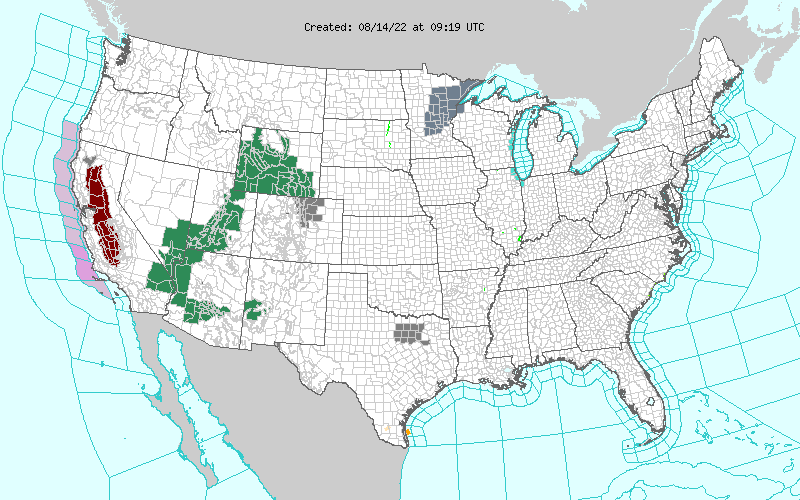 The ensembles are all over the place as well. So we are just going to have to wait several more days for the models to settle down, before we can get a clear picture of what this storm is going to do. 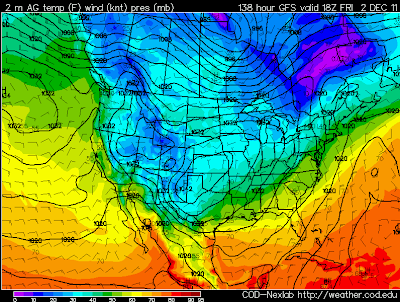 Colder weather is definitely on the way by the end of the week. 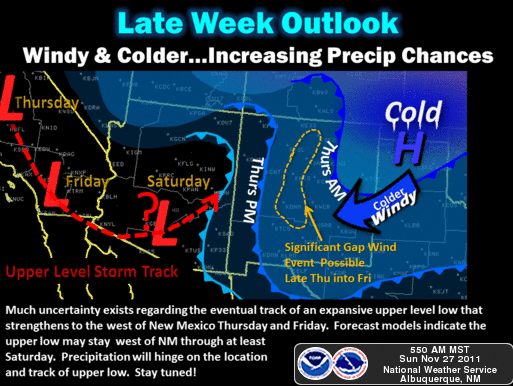 Arctic air could arrive as early as Thursday here in SE NM. Just how cold it will get and for how long is still questionable. It appears that we will at least drop down into the 30's and 40's for highs by Friday, and into the weekend. 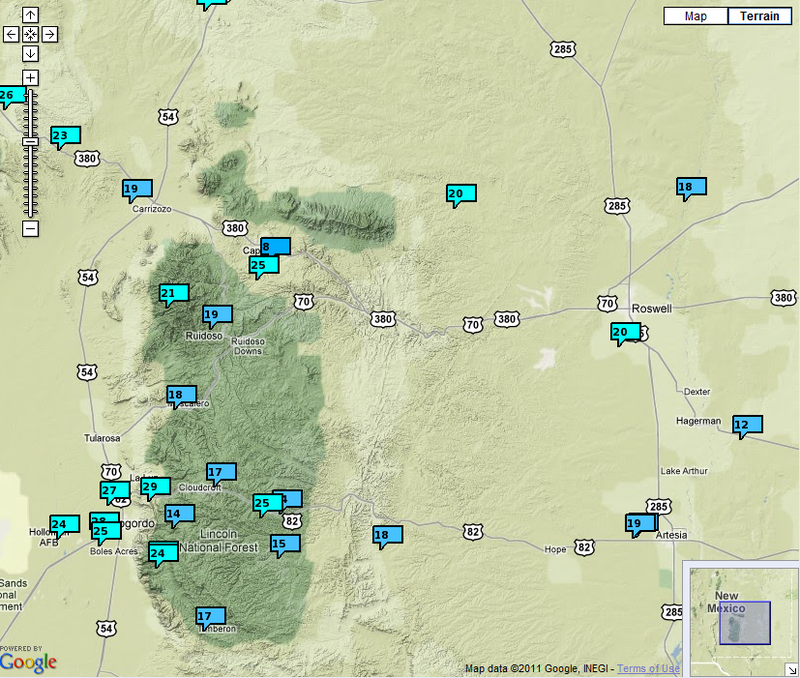 It could even be a little colder than this over parts of the local area. Are we going to get any snow, and if so, how much? That's a tough question to answer this morning. 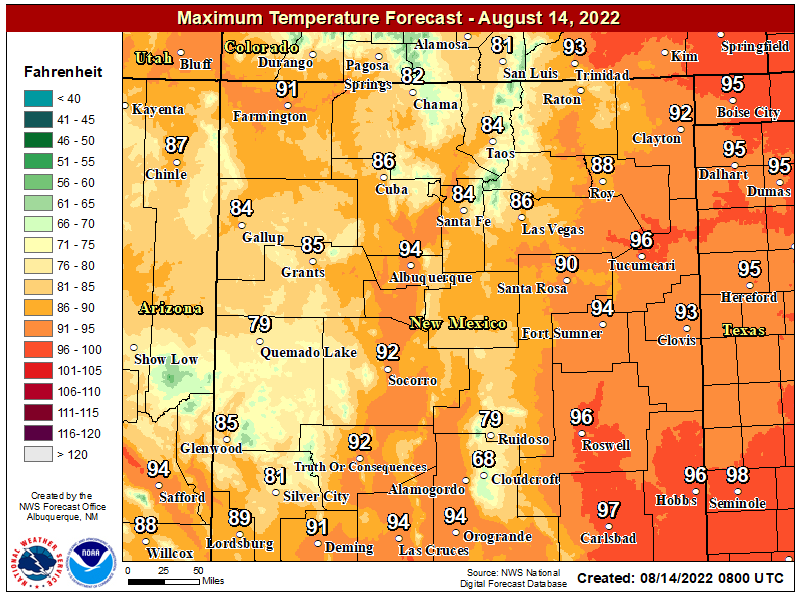 Its still a possibility from Thursday into the weekend. There is the potential for the mountains to receive some heavy snowfall totals with this storm. 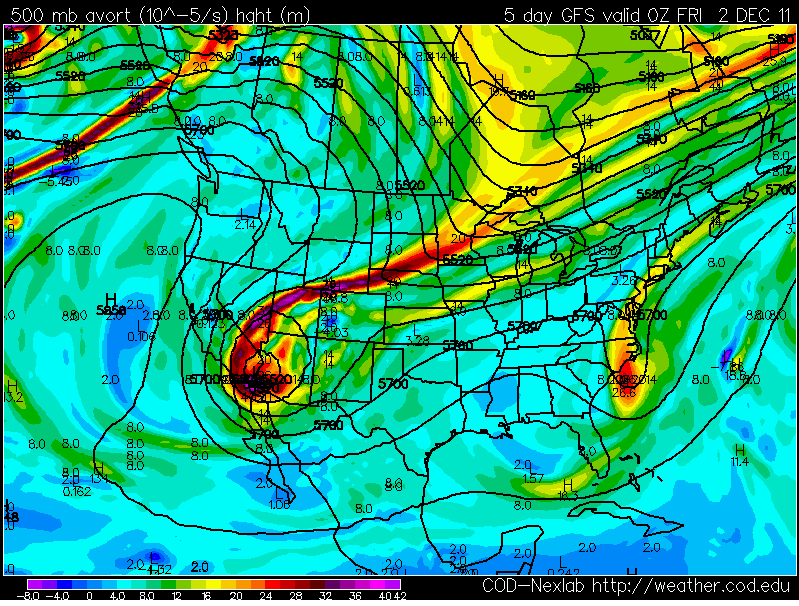 A strong cutoff mid-upper level low is forecast to drop southward into Arizona by around Thursday. Some of the models are dropping this storm further to the south with time, others are not. 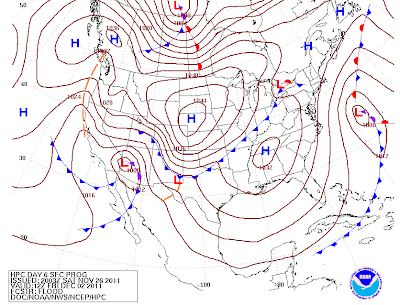 Some of them are dragging this storm slowly across the state from Friday into the first of the following week. 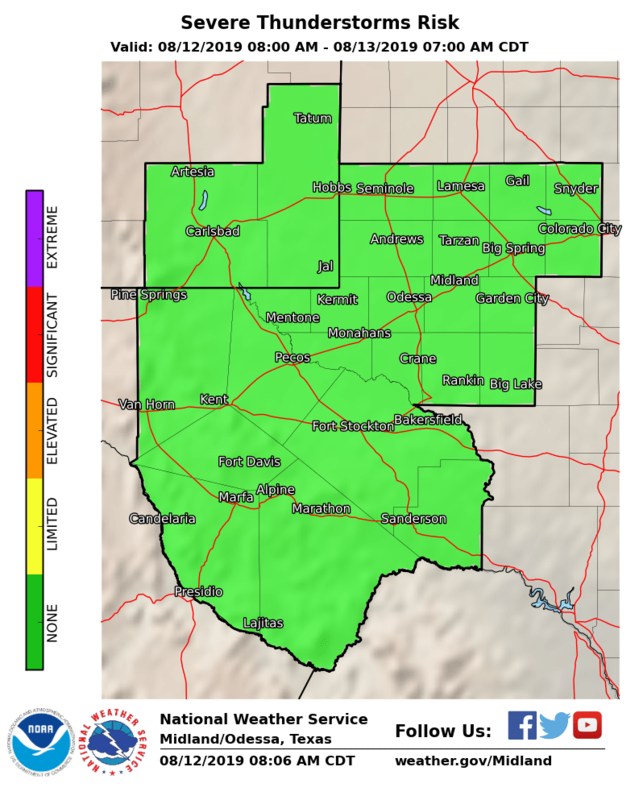 A key factor for how much rain/snow falls across SE NM and nearby areas will be how much low-level easterly upslope flow develops across the area. 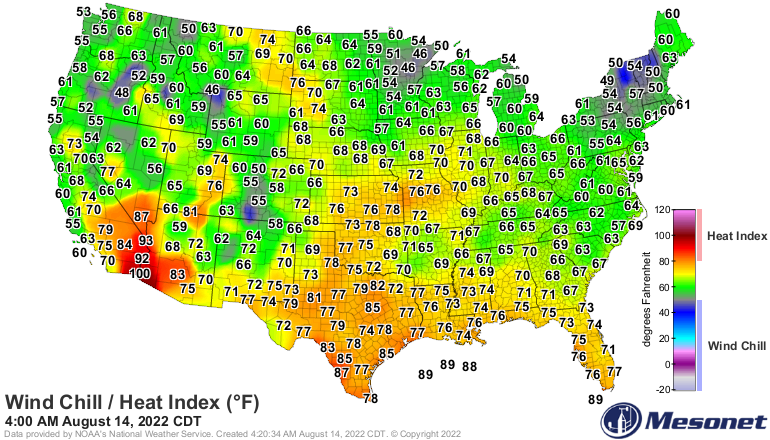 Hopefully the cold air set on the SW moderates some. Though early cold waves are probably as tough on people and plants as are late ones such as Feb '11. 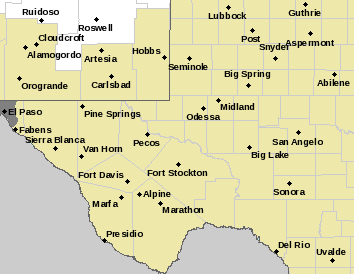 Lots of unknowns with this one David...there is the potential for the cold air to dam up against the central mountains, then spill westward into the Rio Grande Valley and beyond. Cold weather potentially could set in across a good chunk of the state from Thu-Fri into the first of next week.